Hello and Welcome to Day 3 (the final day) of previews for the January release for Sparkle Creations Rubber Stamps! Sparkle is releasing 2 new SCRS images and 1 new Karber clear set, and they are available now! 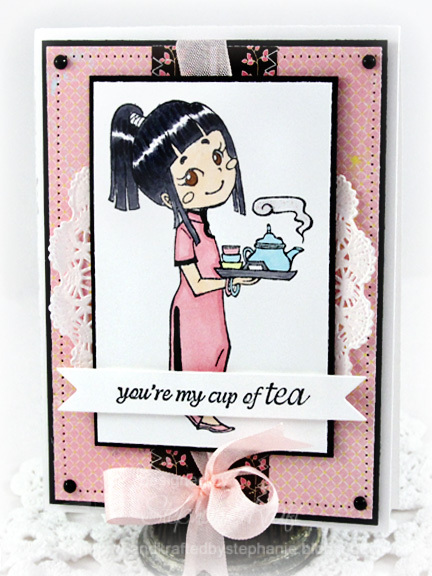 Today we are previewing the final SCRS image, Tea Set Rin and sentiment, "you're my cup of tea"! Be sure to visit all rest of the SCRS designers for more peeks of Tea Set Rin. Sparkle will be giving away a Tea Set Rin to one lucky person! For a chance to win, you need to comment on all of the designer's blogs (list below). Then head on over to the and comment on the Rin post. You have until midnight EST each day to comment. The lucky winner will be announced the following day! Accessories: Die-namics First Place Award Ribbon (My Favorite Things), Markers (Copic), Black flatback pearls (Pizzazz Aplenty), Doily, Seam binding, Foam tape, Thread, Sewing machine. Awe, what a sweet card Stephanie! You did a great job coloring that darling image! Love the highlights in her hair that you captured! Rin looks really pretty in pink! Wonderful card, Stephanie! Such a cute image and so useful. Thanks for the chance to win! Very pretty card Stephanie! I love all the pink with just a touch of black. Thanks for sharing your talent! Beautiful card. Very soft and sweet. Love the addition of the doily and bow. This is beautiful. I love how you did the hair. Rin is so sweet, what an adorable image! Your card is so pretty! So many little details! Great job! Beautiful! I was wondering if we would ever see Rin with a tea set! Aww the doily looks so cute behind her and the bow is the perfect touch! Adorable!